When you hear the word "competitor", do you get all warm and fuzzy inside? I didn’t think so. In business and in life, our competitors are the people who contest with us for resources. Most of us have been taught to see competitors as "bad guys". Really, though, I don’t think of most of those "competitors" as "competitors". I think of them as "peers". They’re my company’s professional rivals — heck, they’re my professional rivals. 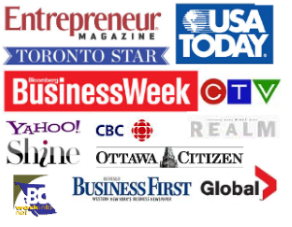 They’re the businesses that push my company to work harder, faster, smarter, better. They’re the people and businesses who make my industry great. The bad guys? Those are the people who try to cheat customers. But even those companies aren’t my competitors — because I’m not competing on offer with the kinds of companies that are set up to rip people off. Of course, that doesn’t mean I ignore my competitors or that I tell them my business secrets. I’m a professional rival, but I’m not stupid! How do you feel about your competitors? How to turn one-off jobs into lasting client relationships is easier than you think. Turning one-off jobs into lasting relationships is, well, all about relationships. You’ve probably heard that it’s easier to turn an existing customer into a repeat customer than it is to convert someone who has never bought from you before. Although true, many consultants focus their marketing and networking efforts on new contacts and they forget about their best source of new work–their previous clients. Turning a one-off job into a lasting client relationship should be your goal from the get-go. Always approach your work with this in mind and you’re off to a great start. This also assumes that, when possible, you’re working with clients that are a good fit. Of course, on occasion some business relationships are not meant to turn into lasting relationships and that’s okay. But if you’ve been pleased with the way a project went and you’d look forward to working with that client again, then it makes sense to invest time and attention into fostering the relationship. Focus on the relationship, not on selling. Believe it or not, your best source of new work is something you already have. And if you mine this existing resource, you’ll be on the road to success. In fact, most successful consultants turn to this marketing goldmine to keep their busy practices growing. What’s the secret? Your existing customers, contacts and fans! That’s right — the secret to your consulting success is in the relationships you’ve already built, not in some sort of secret lead generation tactic. After all, the clients who’ve already bought into your offering are already on your side. And they’re the people most likely to buy again, buy more or tell their friends and colleagues about the amazing work you do. In fact, even a happy low value client is better than someone who signs on for a one-off project that pays 10 times as much. Look at it this way. Say you’re doing a $500 job for a very delighted client three or four times a year. Small potatoes, right? And you get a call from a prospective client who’s offering up a one-time $5,000 job. Which is the better job? Well, if the small potatoes client buys from you over and over, you’ll likely make $7,500 to $10,000 in the next five years — and they may help you land other clients. In fact, if they sell their own contacts on your successes, it may be easier to win those contacts than the ones you turn up yourself. Meanwhile, that $5,000 client isn’t such a hot deal if you never do work for them again. Of course, in a best case scenario, you make both clients so happy that they buy over and over and rave about you to their networks. So what are you doing to build a network of raving fans? What’s your desert island marketing tool? 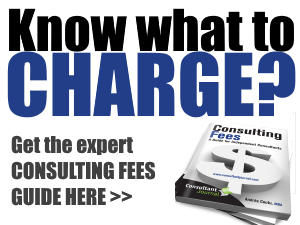 Have you ever stopped to think about how your consulting fees affect your earnings? A while ago, I asked "How often do you increase your rates?" I mentioned that, if you increased your fees by 5% a year for 10 years, you could go from $50 an hour to $81. How does that affect your annual earnings? Let’s say you were billing 20 hours a week for 48 weeks a year. So you started at $48,000 a year. And you increased your rate at 5% a year. Now you’d be earning $77,000 a year — for working the same number of hours. 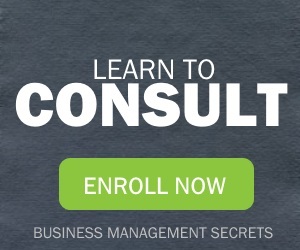 Have you been afraid to raise your consulting fees? Stop leaving money on the table! Should you give clients your IM account info? Several times a day, I chat with friends, family and partners via instant messenger services. I sometimes even chat with clients. But, as a general rule, I don’t give my IM account info to clients. Instant messaging makes you seem within a client’s arm reach. Whereas they have no idea what you’re doing when you don’t immediately answer a call or email, instant messaging services make you look like you’re *right there*. And that’s a little too close for comfort when I’m juggling multiple clients and trying to get work done. Still, for my best and most trusted clients, I make exceptions. These are the people who’ve been working with me for years and who’ve shown an ability to respect my time and privacy. They’re the clients for whom I’d wake up in the middle of the night and go help them jumpstart their car. In other words, they’re much more like close friends than clients now. How about you? Do you instant message with clients? If so, do you "go offline" to avoid interruptions at certain times? tells you they’ve already interview half a dozen consultants and "no one seems to know enough to handle this"
If a client seems like trouble at the beginning, there’s a very good chance that they’ll turn out to be a major pain later. Over the years, I’ve learned to turn and run at the first sign of trouble. I know to trust my gut. Most of my clients are dreams to work with. But every once in a while, I meet a prospective client who gets my spider senses tingling. And that’s when I say, "No thanks. It’s not a good fit" — and move on. In my next post, I’ll explain how the last "troublesome" client helped me create a new policy that has spiked my earning power. 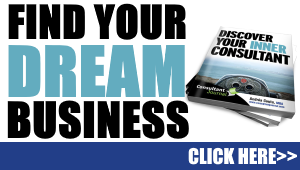 When you leave the world of paid employment and become a consultant, you need to change the way you think. That means no more Mr. Yes Man. (Or Ms. Yes Woman, as the case may be.) Upon becoming a paid expert — a consultant — you need to start standing up for your own beliefs. And you won’t be credible unless you stand your ground. Sometimes, it makes sense to listen to your clients. But, other times, it’s better to stand your ground. If no one every disagrees with you, you either have superhuman sales abilities or you’re doing something wrong. Consultants are experts and experts should, in theory, know more than the rest of us. So if people always agree with you, you might want to check over your work. #381– "If I give you approval, what can I still change?" Clients aren’t the only people who say funny things, but the above quote cracked me up. I’ve run into clients who’ve made some pretty interesting demands over the years. Once, when I delivered a new ad for a struggling restaurant, the chef/owner changed the copy at the production site. Although he was facing his second bankruptcy with the same restaurant and he was paying me big bucks to come up with a new advertising campaign, he insisted on changing the text at the last minute. The restaurant went bankrupt a short while later. 3. Use your data base for them, not against them. Select a loyal customer at random and surprise them with a free gift or a discount. Refrain from congratulating your customers for being loyal with yet another sales pitch. Just send the gift. Fantastic. My phone company recently used a similar ploy. They called and discounted my monthly bill by $8, simply because I’d been loyal. This outbound loyalty campaign made me feel better about being their customer — and likely ensured that I wouldn’t feel the need to shop around. Should you break an NDA to woo a client? You’re in the middle of a meeting with a prospective client. You want this client’s business so bad it hurts. But the prospect has asked the million dollar question: "Who are your clients and what have you done for them?" It’s tempting to rattle off the names of your clients, the problems they faced and the things you’ve achieved for them. But providing too much detail may put you in ethical, if not legal, hot water. If you’re under a non-disclosure agreement, you can’t identify your client or provide identifying information about their business problems. Even if you’re not under NDA, it’s not really right to talk behind your clients’ backs. So what can you do about this? Describe the client, not their name. "I worked on a project for a major brand name beverage company". Deflect requests for the client’s name. Say "I’m under NDA and I need to respect my client’s confidentiality" or "I’m not in a position to name the client, but I can provide some examples of what I did for them…." Collect testimonials from existing clients. Ask your existing clients to provide references — but rotate them, so that you don’t end up with annoyed clients. Stick to your guns. If you’re protecting a client’s privacy, you shouldn’t reveal details, no matter what the means of communication. If you wouldn’t write it in an email or proposal, you shouldn’t be willing to divulge it in person either.